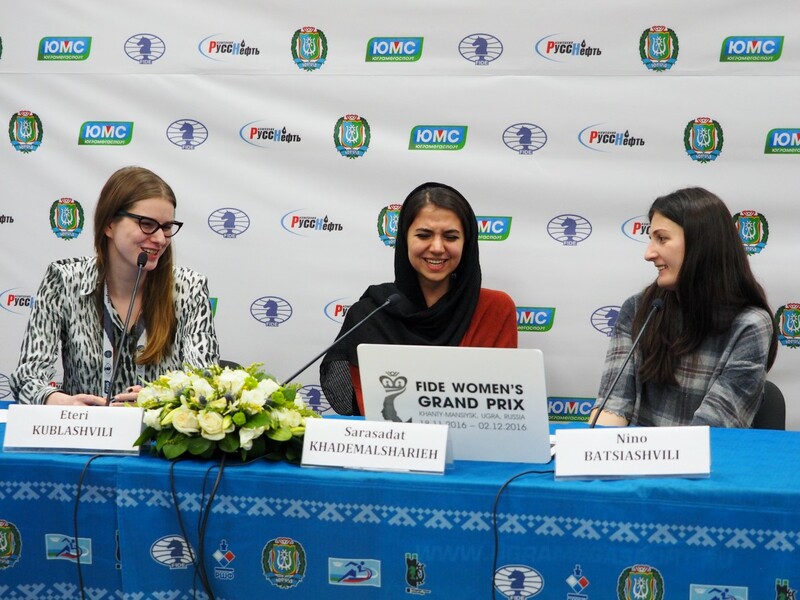 Nino Batsiashvili is maintaining the lead at the 5th leg of the FIDE Women’s Grand Prix in Khanty-Mansiysk, but the peloton is growing – now Sarasadat Khademalsharieh and the Russians Alexandra Kosteniuk, Valentina Gunina and Olga Girya are following her within 1 point behind. As always, the more games are being played, the more tired the participants are, and thus the amount of bitter mistakes and lost chances is growing. Valentina Gunina self-destructed in the game against Natalia Zhukova and eventually lost. Although White’s position may seem to be a little suspicious, there is actually no danger for her. Valentina, as she said at the press conference, had calculated many lines and had chosen the riskiest move 21. h4?! 21. Bxe4 lead to an equal endgame with a normal positional play. In the game Gunina miscalculated the lines connected with 22. Be2, but still it was more preferable for White after 22… Rxd2 23. Bxh5 (Valentina considered 23. Rxd2 Qf5! winning material after 24. Bd3 Qd5) 23…Rxb2 24. Nxb2, and the position is playable for White. 22…Qxd1+ 23. Rxd1 Rxd1+, and step by step Black converted her advantage in a long-term struggle. 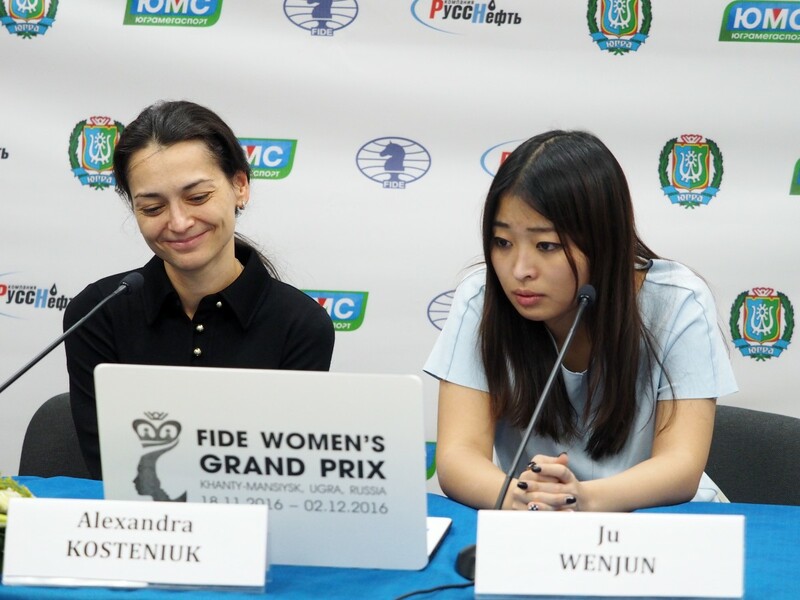 Ju Wenjun chose the Petroff Defence against Alexandra Kosteniuk with Black, but her opponent was quite enough ready for it. Alexandra was pushing on the kingside, not being afraid of the far-advanced “d” pawn of Black. In the time trouble White managed to create considerable threats to the black king, and at the 39th move Wenjun made a mistake. It was better for Black to play, for example, 39… Rg7 and it’s hard for White to invent something winning just on the spot. 40. Qh4! Kf8 41. hxg6 hxg6 42. Rxd3! Rxd3 43. Rxd3 Qg8 44. Rd8+, and soon White celebrated victory. In all other games the draws – more or less eventful – were made. Almira Skripchenko and Natalija Pogonina discussed the Giouco Piano where the pieces and pawns’ structure resembled a little bit the one from the 10th game of the World Chess Championship Match in New York. 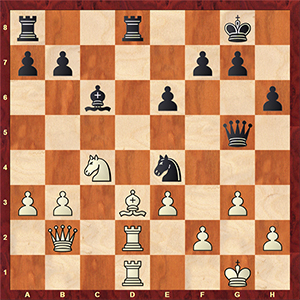 White got a very comfortable position with a certain edge, but at some point, Almira, probably, acted not very precisely, and the play gradually equalized. Although there were many pieces left on the board, the players agreed to a draw on the 31th move. 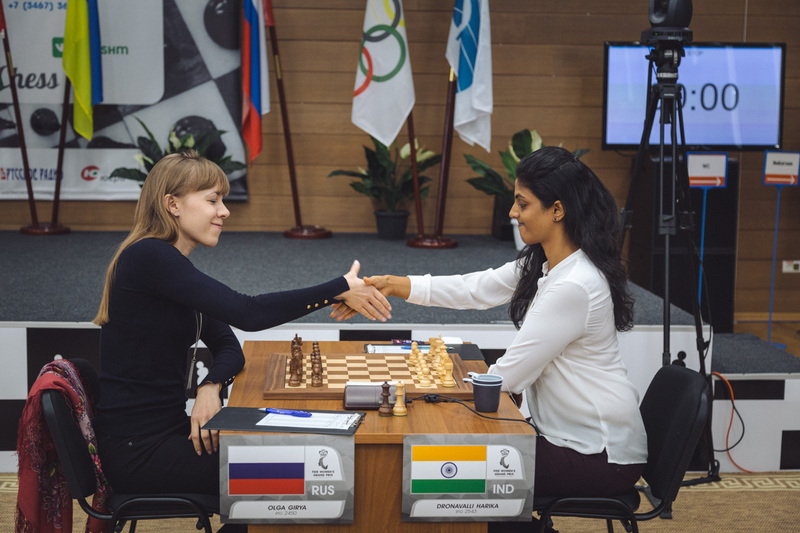 Olga Girya met Dronavalli Harika’s 1.e4 with the Caro-Kann Defence (the first one at the tournament), and after the game the Indian grandmaster confessed, that she hadn’t remembered her preparation exactly. After the opening Black achieved a comfortable play and gained the initiative. In a very complex middlegame both sides were acting energetically, though being in a time trouble, but perhaps Black shouldn’t have offered queens’ exchange, after which the game simplified a lot, and the draw became the most logical outcome. In the Georgian derby Javakhishvili-Khotenashvili the latter has chosen the Gruenfeld Defence for the second time in a row. White had a space advantage, but Black were defending very accurately, and Lela didn’t manage to break her opponent’s bastions. The leader of the tournament Nino Batsiashvili made her first draw playing Black against Sarasadat Khademalsharieh. 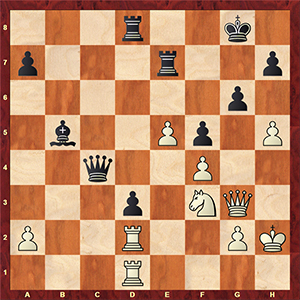 In the middlegame after the Queen’s Indian White has chosen not the most precise plan and Black managed to solve all their problems. Further on, the play didn’t step over the bounds of equality, and logically drifted to a draw. The current leader of the whole series is… Humpy Koneru, due to the losses of Ju Wenjun and Valentina Gunina. But there are 5 more rounds ahead, so, as Alexandra Kosteniuk said at the press conference, everything would be decided in the last three rounds as usually. 1. Nino Batsiashvili – 4,5, 2-5. Valentina Gunina, Sarasadat Khademalsharieh, Olga Girya, Alexandra Kosteniuk – 3,5, 6-8. Dronavalli Harika, Ju Wenjun, Natalia Zhukova – 3, 9-10. Natalija Pogonina, Bela Khotenashvili – 2,5, 11. Almira Skripchenko – 2, 12. Lela Javakhishvili – 1,5.